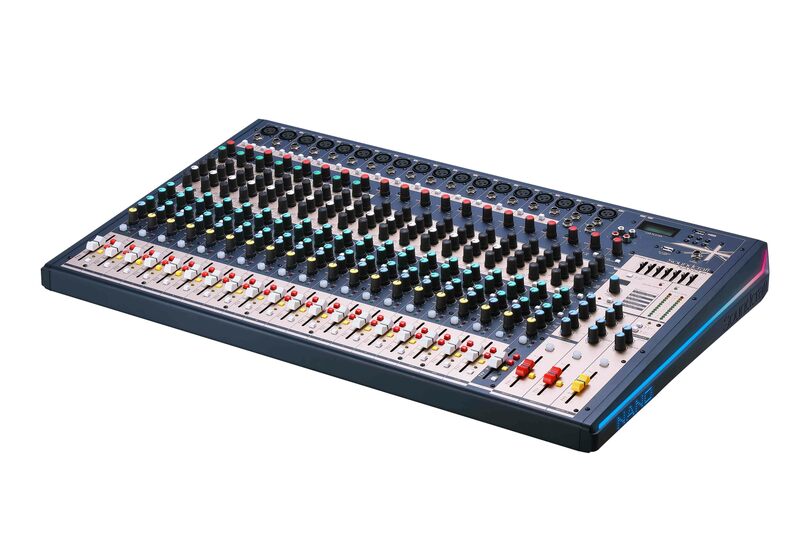 NANO Series multi-channel analog mixing console inherits legendary SOUNDCRAFT craftsmanship and is designed to meet various application requirements from live performance, studio recording and fixed installations. 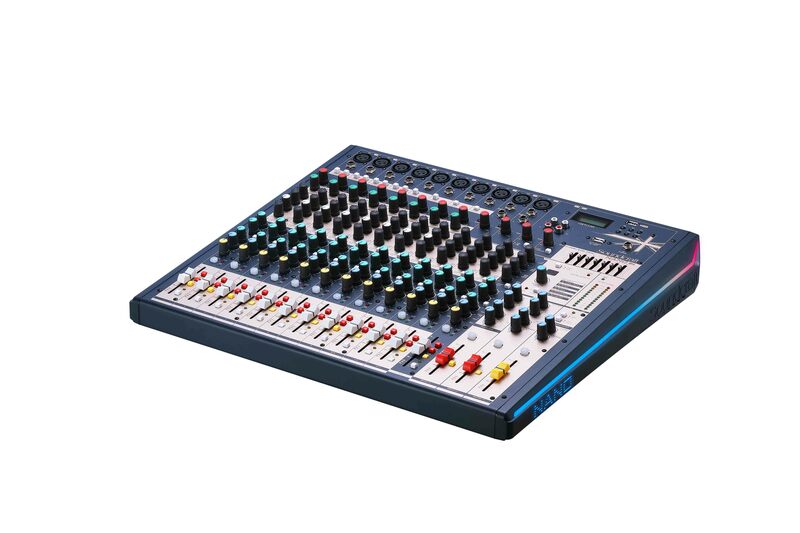 NANO Series owns two models in its product portfolio: M16 (16 channels) and M24 (24 channels) and represents a new level of design, quality and performance. 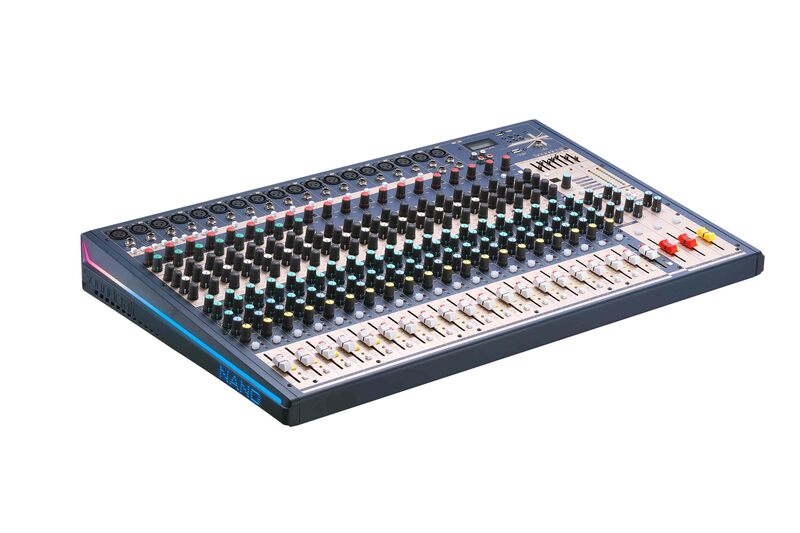 M16 and M24 offer all the functionalities required for live mixing and studio recording: 8/16 mono input channels with ultra-low noise discrete MIC preamp and +48V phantom power; 4 stereo input channels; each mono input channel equipped with 3-band EQ and sweepable MID; each stereo input channel equipped with 4-band EQ; 4 auxiliary controls; 12-segment output level meter; 2-track input routable to main mix, control room / headphones. M16 and M24 identify themselves for their cutting-edge and eye-catching appearance. 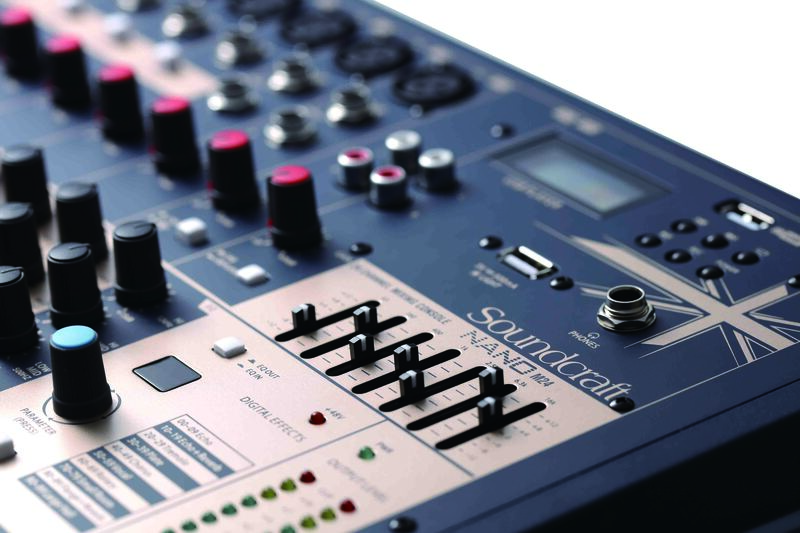 The uniquely-designed Atmos Meter showcases SOUNDCRAFT’s dedication to engineering innovation and adds extra visual effects to live performance. The built-in USB player supports MP3 playback and recording. 24-bit DSP processor provides up to 100 effect presets. Main mix out comes with a 7-band GEQ and an insert point. M16 and M24 accommodate all the control and connection elements in a robust steel case and install connectors built from metallic materials of highest industrial standards. 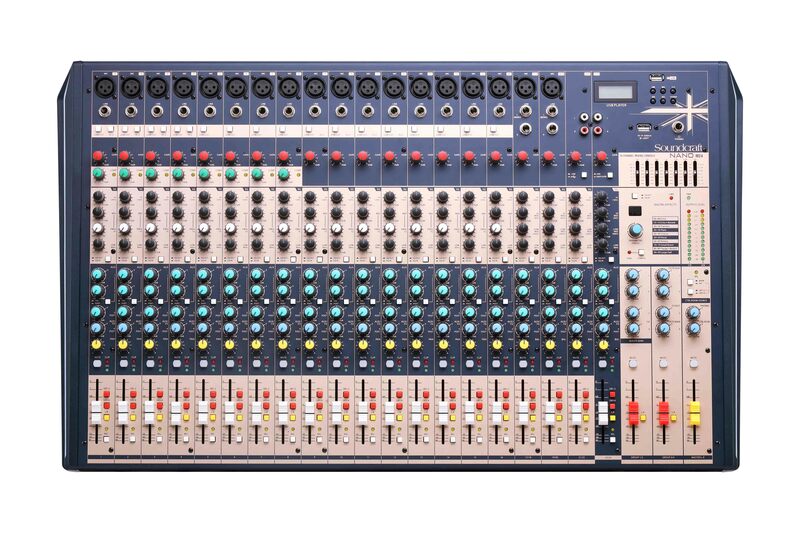 Compact and ultra-light build, cutting-edge design, and acclaimed SOUNDCRAFT artisanship make NANO an optimal choice for band gigging, studio recording or fixed installation. Ultra-low noise discrete MIC preamp with +48V phantom power. 8 / 16 mono input channels and 4 stereo input channels. 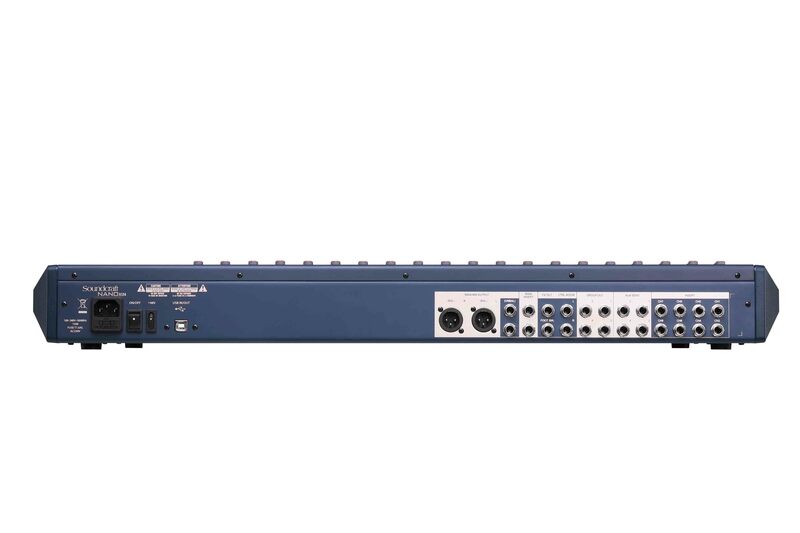 Each input channel accepts balanced XLR MIC input and TRS LINE input. Low cut for each MIC input. Each mono input channel is equipped with 3-band EQ, sweepable MID and PEAK LED. 2 stereo input channels accept mono XLR or TRS input; 2 stereo input channels accepts RCA input. Each stereo input channel is equipped with 4-band EQ and PEAK LED. 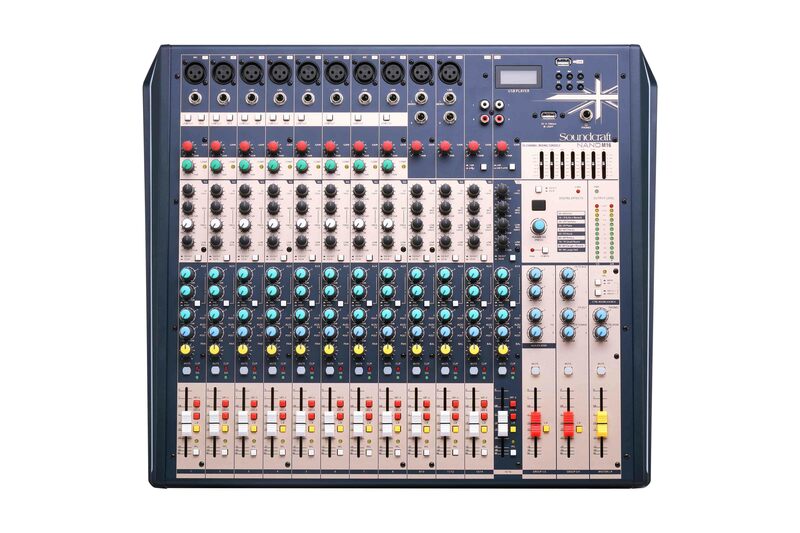 8 compressor controls and 8 channel insert points. AUX 1 & AUX 2 send post/pre-fader signal for monitoring or external effects; AUX 3 & FX send post-fader for internal effects or monitoring. PFL/MUTE and 60mm fader for each channel. GR1/2, GR3/4 and MAIN L-R buss assignment for each channel. MAIN MIX installs a pair of balanced XLR and a pair of unbalanced TRS connectors and can be equalized via a 7-band GEQ. MAIN MIX supports external effect insert. 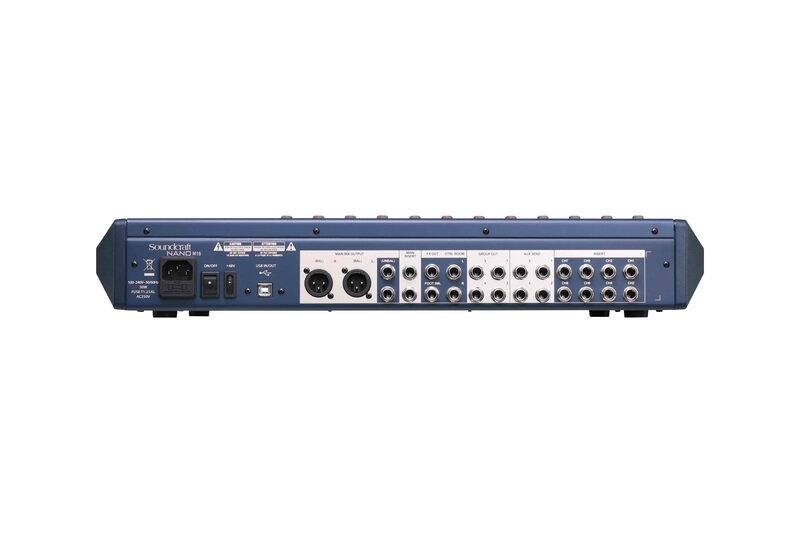 24-bit DSP processor provides up to 100 effect presets. USB player for MP3 playback and recording. Switch-mode power supply for 100-240Voltage. 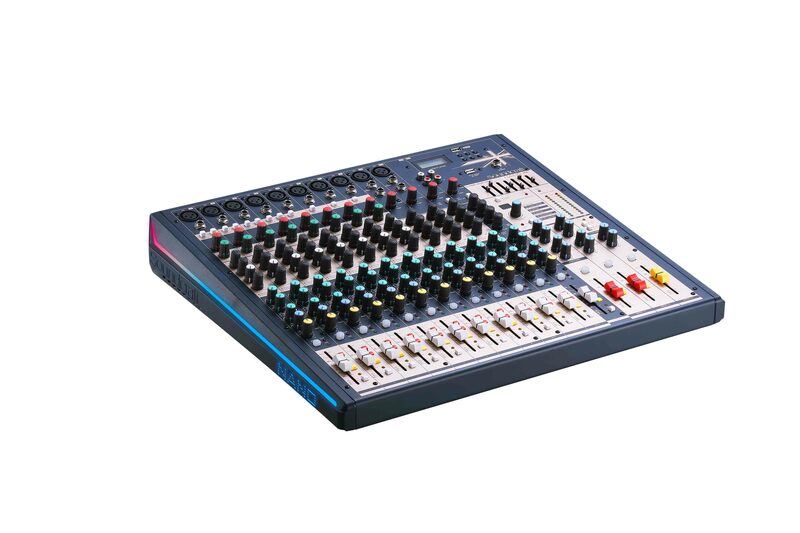 USB port for MAIN MIX recording or playback through CH 15/16 (M16) or CH 23/24 (M24). Cutting-edge and eye-catching design. Uniquely-designed Atmos Meter adds extra visual effects to live performance.